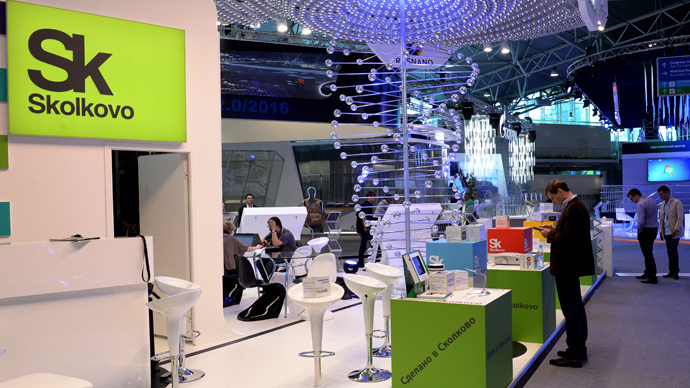 The 17th International Economic Forum in St. Petersburg has kicked off. More than 4,000 business leaders, policy makers, and economic experts from around the world have come together to brainstorm ways out of the global economic crisis. This year's theme is 'Finding Resolve to Build the New Global Economy'. The 3–day forum will address a global agenda for a sustained economic growth, looking at Russia in the global context, as well as brainstorming new catalysts for the changes. 16:14 MST: With the three-days of round tables and business negotiations in St. Petersburg having ended, Russia’s Economic Development Minister Sergey Belyakov has told the Russia 24 TV channel that 102 deals worth $316.7 billion were made. 15:54 MST: German global diversified retail and wholesale cash & carry group Metro is ready to increase investment in Russia and wants to enter the Far East. "We've had a presence on this market for over 10 years, during which time we've invested more than $3 billion in Russia, and we intend to increase investment," said Metro Group CEO Carry Olaf Koch. 15:00 MST:"We'll [keep] 50% + 1 share [in VTB bank] until 2016," said Federal Property Agency (Rosimushchestvo) head Olga Dergunova. The state currently owns 60.9% of the country’s second-largest lender. 14:56 MST: Russia plans to spend over US$4 billion in 2014-25 to repair accumulated ecological damage, said Russian Natural Resources and Ecology Minister Sergey Donskoy. “Total investment in the environmental sector should at least double in the next decade,” he said. 14:15 MST: A draft law on amnesty for economic crimes could be presented to the Duma as early as this Sunday, said Presidential Commissioner for Entrepreneurs’ Rights Protection Boris Titov. The first jail releases could take place this summer, Titov added. 14:01 MST: The key concern for the US investors is Russia’s unpredictability, according to Andrew Somers, the President of the American Chamber of Commerce in Russia. Russia is largely perceived as a country where “any unpredictable thing could happen,” he said. 13:59 MST:“We are interested in the growth of Russia’s natural gas deliveries to Britain,” said UK Energy Minister Michael Fallon. Also, we “account for wider cooperation, which includes gas storage, electricity, and infrastructure projects,” Fallon added. 12:52 MST: Russia’s IT research and development centres could receive some $666 million annually from the state starting next year, said Deputy Communications Minister Mark Shmulevich. The Communications and Education & Science ministries’ program is scheduled to run for five years, with 30-50 research centers involved. 13:45 MST: The Russian government may sell its stake in telecoms operator Rostelecom next year "if the situation is favorable and we see that everything is ready and that we can get an adequate price,” said Communications and Mass Media Minister Nikolai Nikiforov. 12:34 MST: Russia’s Federal Property Agency is not planning to sell its stake in Rosneft this year, said agency head Olga Dergunova. The largest possible cut in the state’s stake could be to a controlling one of 50% + 1 share, Dergunova added. 12:14 MST: German shipbuilder Nordic Yards may begin cooperating with its Russian counterparts, said company owner and Managing Director Vitaly Yusufov. Nordic Yards could take on complex orders in which Russia has little experience, Yusufov added. “We have the opportunity jointly to realize projects with the United Shipbuilding Corporation, which includes schemes of technological cooperation,” he concluded. 11:50 MST: Russia’s banking sector needs more competition, according to the IMF. Smaller Russian banks control less than 3% of the market each, while state ones such as Sberbank and VEB constitute almost half of it, said the IMF Managing Director David Lipton. Higher competition could help the transfer of deposits into investment, Lipton concluded. 11:28 MST: Russia’s IT industry could grow three times faster than the country’s GDP over the next three years, said Deputy Communications Minister Mark Shmulevich. “Venture investment into Russia’s IT industry will go above US$1 billion,” he added. 10:54 MST: Recession is not threatening Russia’s economy, said International Monetary Fund Managing Director David Lipton. “We do not think that stimulating the economy or devaluing the rouble would be useful, since such steps could trigger just short-term growth and lead to higher inflation and a worse investment climate,” Lipton explained. 10:46 MST: The internet is less regulated in Russia than in Europe, according to Ashmanov and Partners CEO Sergey Ashmanov. “The internet cannot be outside the law”, Ashmanov added. 10:18 MST: One of the key problems in Russia’s IT market is a staff deficit, said Mail Group head Dmitry Grishin. “There’s no call in the market for the things that are being taught at institutions of higher education,” Grishin said, adding that this was because Russia’s education still follows the Soviet-era model. 10:16 MST: Amnesty for economic crimes will be backed by all Duma fractions, said Presidential Commissioner for Entrepreneurs’ Rights Protection Boris Titov. The amnesty will involve those convicted for the first time and who had compensated the losses or are ready to do so, said President Vladimir Putin while addressing the Forum on Friday. 9:54 MST: Russia’s Labor Ministry has prepared a draft law implementing the payment of higher insurance premiums to the country’s pension fund for people working in hazardous industries. The rate is to go up to 2-10% of an employee’s salary from the current 2-4%. 9:38 MST: Norwegian telecoms company Telenor may increase its share in mobile operator Vimpelcom. “In case Russia’s government revises the rules regarding foreign investors in telecommunication and the second co-owner of Vimpelcom won’t be against that, this could happen in the future,” said Telenor Executive Vice Presiden Kjell-Morten Johnsen. Here’s the schedule for the 3rd day at the Economic Forum in St. Petersburg. 19:00 MST: We are wrapping up coverage at SPIEF for today, join us again tomorrow for LIVE UPDATES. 18:50 MST: Russia plans to sign bilateral agreements with offshore territories on broadening tax data exchanges. 18:35 MST: Vnesheconombank (VEB) had signed a memorandum of understanding on the development of the Vladivostok International Airport with the Baikal Region Development Fund and the Pirmorye territorial administration at the Forum. 18:29 MST: President Putin gives Chancellor Merkel a topography painting symbolizing Russian-German peace after the war of 1892 as a polite gesture. 18:28 MST: President Vladimir Putin optimistic on a "regular" Russian-German dialogue. 18:28 MST:"We will not set up any barriers for Russian enterprises" - Merkel. 18:26 MST:"For progress, we don't need to inflate the issue, we need to meet each other half way. We don't need to start a debate right now," Putin said after a reporter asked a question on the art exhibition controversy of Germany's 'trophy art' from WWII being held at the Hermitage museum. 18:21 MST:"These are not games, these are not toys, you need to be pragmatic and practical" - Putin. 18:20 MST: Syrians must decide if President Assad stays or goes- Putin. 18:16 MST: Putin warns the political vacuum that would appear if the West takes out Assad could be filled by terrorist organizations. 18:15 MST: Putin and Merkel again field Q&A on Syria. 18:00 MST: Business activity indicators for Sochi2014 have grown 12-fold. 17:53 MST: UniCredit, which has been active in Russia for 25 years, plans to increase market share from its current 2 percent hold, according to Chairman Giuseppe Vita. 17:40 MST: Rosneft has signed an agreement with two Japanese companies to deliver Russian LNG starting in 2019. "The cities that are becoming the most competitive and the fastest are emerging market cities whether its Incheon in South Korea, whether it is Mumbai, whether its Sao Paulo, these are the ones that are moving the fastest .We project that the top 400 emerging market cities will probably contribute over half the GDP growth between now and 2025." "I think it underlines the overall potential that Russia has, that would be the major supply both of gas and oil for many many decades ahead. Two thirds of yet-to-be-discovered resources on the planet are in the Arctic and these positions are being taken now- including Russia- and we have been fortunate to be part of that together with Rosneft." 17:05 MST: Putin promises to provide a duplicate of the ring 'in case the ring is of any value'. 17:04 MST:"I don't recall that certain souvenirs were handed over" - Putin. 17:03 MST: Now for the 'international question of intrigue' - the Super Bowl ring. 17:01 MST:"I do have a certain degree of skepticism" - Merkel, on Turkey. 16:58 MST:"Those who are good in this world is decided by competition. I think Europe right now is faced with understanding that globalization is presenting new challenges, and we can only confront them together" - Merkel. 16:53 MST: "We cannot recapitalize the Europeans banks without the national governments taking a burden" - Merkel. 16:52 MST: "It shouldn't always be the taxpayer who pays for 'too big too fail' banks. We need a cascade of responsibilities" - Merkel. 16:51 MST: Russia is ready to listen to our partners under the conditions no one dictates rules in a mentoring tone, Putin said. "We have to say lofty words to be heard." 16:50 MST: Russia's president is not someone who keeps his voice down, Merkel said. 16:49 MST:"Europe is the biggest partner of Russia. We have more than $400 billion in trade turnover, so we are moving towards achieving cooperation" - Putin. 16:44 MST:"I don't potential partnership between EU and Russia has been fully utilized" - Merkel. 16:39 MST: We need to assume cheap energy won't be available and we need to go after more difficult and hard to reach oil and gas reserves - Putin. 16:37 MST: Putin says Gazprom prices are comparable to American prices. 16:33 MST: The debt of Russia is 2.5 percent, the Eurozone is 10 or 11 percent. 16:31 MST:“I want Europe to remain a prospering continent which can compete with the rest of the world,” Merkel said. 16:29 MST: It wasn't Germany who decided on austerity, it was a shared EU decision - Merkel. 16:27 MST:"We have not yet returned to a full global balance" - Merkel. 16:26 MST:"It was not a surprise for us, it is a decision in the right direction. I believe its a healthy decision," Putin said on the US Federal Reserve's decision on quantitative easing. 16:24 MST: The debt of Russia is 2.5 percent, the eurozone is 10 or 11 percent. 16:23 MST:"The UK is part of the EU, it is enriching us. it can be a very good driver" - Merkel. 16:22 MST: "Everyone in the G8 is working towards relieving suffering and instability in Syria" - German Chancellor Angela Merkel. 16:16 MST: Russia doesn’t violate international law by supplying arms to legitimate Syria government - Putin. 16:15 MST:"Without arms supplies from abroad, what is happening in Syria right now wouldn't be possible" - Putin. 16:14 MST: How can the US give weapons to Syrians they view as terrorist organizations? - Putin. 16:14 MST: Putin says that Geneva 2 on Syria should be convened ASAP. 16:13 MST:"Our main and concern is to end violence in Syria as soon as possible" -Putin. 16:09 MST: Putin and Merkel now fielding questions from the audience. 16:05 MST: China is the biggest emerging country in the world. Oil and gas are the main spheres of cooperation between Russia and China - Zhang Gaoli. 16:03 MST: Vice Premier of People's Republic of China has taken the stage. 15:59 MST:"We are ready in all sectors to support Russia with investments and advice" - Merkel. 15:57 MST: The single greatest threat to the EU is youth unemployment - Merkel. 15:56 MST: Germany is facing a great demographic challenge- Merkel. 15:55 MST:"We can only be prosperous if the whole European Union is prosperous" - Merkel. 15:52 MST:"North stream is a truly European project" - Angela Merkel citing companies Rosneft and Gazprom. 15:50 MST: Germany and Russia had a record high trade volume of 80 billion euro last year, and in the last 10 years the trade has tripled. 15:49 MST:"Germany wishes to support Russia in the process of opening and diversifying its economy" - Merkel. 15:48 MST:"We know from previous crisis, it was difficult for the world to generate growth. It's going to be very important to send a message from G20 that we are working for free global trade. We will all have to be open to competition" - Angela Merkel. 15:40 MST: Economic amnesty project is ready - Putin. 15:37 MST:"We do not distinguish between 'us' and 'them' because we are interested in investors that act decisively," Putin told onlooking economic experts, delegates, and investors at SPIEF. 15:31 MST:"We expect LNG export to double" - Vladimir Putin. 15:29 MST:"The privatization of VTB will be conducted step by step, and will raise the transparency and openness of our companies" - Vladimir Putin. 15:27 MST: Putin offers delegates three investment projects- high-speed railway between Moscow-Kazan, the Moscow Region ring road, and the Trans-Siberian Railway. 15:25 MST:"Russia is willing to invest money. We are interested, strong, and reliable partners" - Vladimir Putin. 15:25 MST:"We are expanding the capacity of the Trans-Siberian Railway. It is the longest railroad in the world -10,000 km- and will be the artery to link Asia Pacific," Putin said. 15:24 MST:"The central ring road will link together central parks of the country, and will lift the traffic burden of Moscow," said President Vladimir Putin. 15:24 MST: A high speed railway will connect Moscow and Kazan. 15:21 MST: Our key goal is to remove infrastructural limitations which are stifling our economy and limiting Russia from reaching its full potential. 15:20 MST: Putin says Russia's era of high energy revenues are over, and there is no 'magic wand' to replace it. 15:19 MST:"We have to create conditions for long term investment in order to change the structure of our economy," Putin addressed the 'Global Growth' audience. 15:18 MST: Last year, inflation in Russia was 6.1 percent, and now it is at 7 percent, which is still acceptable, but we have a long way to go - President Vladimir Putin. 15:17 MST:"Economic growth should be based on three pillars- increased labor productivity, investment, and innovation," President Vladimir Putin said at SPIEF. 15:11 MST: Putin and Merkel take the stage at the St. Petersburg International Economic Forum. 15:04 MST:Rosneft and Chinese state-oil company CNPC have signed a $270 billion oil export agreement.Under the contract, Rosneft will supply 360.3 million tons of crude oil to China over the next 25 years. 15:00 MST:Tax incentive measures were proposed to develop difficult to extract oil reserves and taxation projects on oil shelves," Vladimir Putin said at the Rosneft 'Energy Club Summit' panel. 14:46 MST: Rosneft has already signed LNG agreements with Eni, Exxon, and Statoil at the St. Petersburg International Economic Forum. 14:42 MST: Putin proposed to create a global energy council, a topic he will further discuss with G20 leaders. 14:35 MST: Russian oil industry is entering a new stage of development - Vladimir Putin. 14:27 MST: Putin has arrived at the Rosneft panel. 14:21 MST:"We need to grow more than we are doing so now. With today's oil and gas prices we anticipate 5 percent growth maybe next year or in 2015, but not now unfortunately," Igor Shuvalov, Deputy PM said at SPIEF. 13:56 MST: Russia's gas major Gazprom will buy a power plant from Italian energy group Enel for 200 million euro. 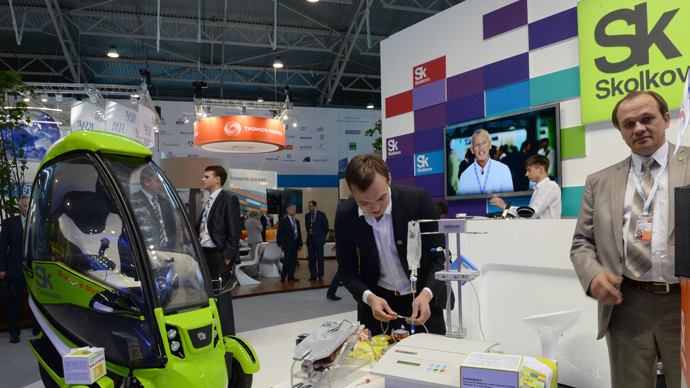 The two companies signed a memorandum on the sidelines at SPIEF. 13:41 MST:"Human capital is our main resource," said Oleg Deripaska, owner of Basic Element, an energy asset group. 13:23 MST: A pack of cigarettes should cost 200 rubles said the head of the Ministry of Health. 13:08 MST: Russia is 'hugely' dependent on oil and gas prices- Russian Deputy Prime Minister Shuvalov. 13:05 MST: Putin and Merkel to address St. Petersburg International Economic Summit at 15.00. 13:02 MST: Pre-lunch panels have finished. Next is Rosneft's 'Reshaping Global Oil Markets'. 12:58 MST: The Russian economy is expected to grow to over $3.2 trillion in 2017. 12:50 MST: Sberbank chief German Gref says to stop panicking about weak rouble exchange rates. 12:45 MST: Gazprom and GDF SUEZ, a French electric utilitiy company, will study the possibility of expanding the Nord Stream pipeline. 12:40 MST: Cyprus and Russia will restructure 2.5 billion euro loan by September, Russian Deputy Finance Minister Sergey Storchak told reporters. 12:31 MST: On splitting up the Siberian Sea gas blocks, "Gazprom will explore the northeast sector, and Rosneft will get the first," Gazprom CEO Aleksey Miller told reporters at SPIEF. 12:17 MST: BRICS are a reaction to our changing world - Russian Deputy Finance Minister Sergey Storchak. 12:08 MST: 60% of the BRICS audience favorably view the BRICS as a viable 'union'. 12:06 MST: Happening now: BRICS panel with Helen Clark from the UN and Anton Siluanov, Russian Minister of Finance. 12:00 MST: Putin and Merkel are set to meet on the sidelines at the Forum today, and will meet the press after their meeting. Trade between the two countries is nearly $74 billion and over 6,000 German companies are active in the Russian market. 11:57 MST: Capital flight from Russia expected to be less next year than it was last year, which was estimated at over $50 billion, according to Andrey Belousov, Minister of Economic Development. 11:50 MST: The Russian economy shows some signs of overheating, Russian Finance Minister Anton Siluanov said. 11:38 MST: Rosneft, Russia's largest oil company, will supply China with 365 tonnes of oil in the next 25 years, according to CEO Igor Sechin. The deal is valued at $270 billion. 11:28 MST:"Trying to prevent capital flight from Russia is useless and conflicts with international obligations of the Russian Federation," said Andrey Belousov, Minister of Economic Development. 11:05 MST: Pepsi has invested over 9 billion dollars in Russia in the last 10 years. 10:58 MST:"The key question in a state is effectiveness of social and financial policy. It's very important to compare results. We spend only 4 percent of our GDP on healthcare in Russia, in USA, 15 percent. Italy and Spain- only 5 percent and they have good indicators as well," Olga Golodets, Russian Deputy Prime Minister. 10:49 MST:"All governments should regulate the financial sector and focus on livelihood of their people. The focus should be on reducing risk and increasing capital at the banks," Andy Xie, Independent Economist, China said at the RT debate. 10:25 MST: The second day of heated economic discussion and business negotiations has kicked off in St. Petersburg, Business RT will keep you up to date with all the key events at the forum. On Friday a round table of oil companies is set to come to the fore, when some huge energy contracts are expected to be sealed. 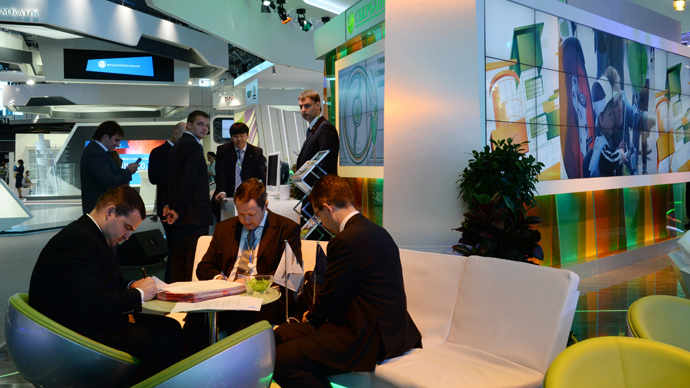 Energy giants as ВР, General Electric, Shell, and Total will attend the talks. Russia’s President Vladimir Putin will explain Russia’s energy strategy and add his impetus to attracting foreign investment in the industry. A meeting with the forum’s honorary guest German Chancellor Angela Merkel is also on the agenda. 10:20 MST: Today's schedule. For live broadcast, check out the SPIEF website. 09:45—11:00: Russia Today Televised DebateCRISIS IN CAPITALISM: CAN THE MODERN WELFARE STATE AND GLOBAL COMPETITIVENESS BE RECONCILED? 11:45—13:00: ACCESSIBLE GRIDS: AN ATTRACTIVE INVESTMENT CASE OR SOCIAL INFRASTRUCTURE? 19:44 MST: "Gas hydrates are the resource of the future," - Russian Minister of Energy, Alexander Novak. 19:34 MST:"We believe openness and unrestricted access area prerequisites for promoting democracy and stability," Viktor Vekselberg said about internet restrictions, decimation of information, and intellectual property. 19:26 MST: Viktor Vekselberg speaking now on intellectual property rights at final panel. 18:58 MST: Russia is looking for investors for the following projects: a high-speed road from St. Petersburg, an introduction of tolls for trucks weighing over 12 tonnes, and construction of a new northern sea port, according to the Minister of Transport. 18:53 MST: Russia's train transport ranks 30th in the world, roads are ranked 101st, and aviation 136th. The department of transport will heavily look to private investment in developing these industries - Oleg Belozerov, Deputy Minister of Ministry of Transport of the Russian Federation said at the 'Logistics impact' panel. 18:37 MST:"The good news is that the Russian economy still has growth in sectors that are still quite vibrant,and these successes are something that we would all like to see the regime turn towards," Bernard Sucher, Member of the Board of Directors of Aton Investment Group told RT in an interview this morning. 18:34 MST:"The reality in Russia is that until we have investorswho have a high degree of confidence and trust in the way Russia is administered, you are going to have a real difficult time with wresting with deoffshorization," Sucher told RT. 18:18 MST: Sberbank has already signed over $800 million worth of agreements in St. Petersburg today, TASS news agency reports. 18:17 MST: Mercedes Benz will unveil it's new S-class sedan at the Forum. 18:15 MST:"Currency is a very dangerous instrument to boost an economy," Ruben Vardanian, co-head of Sberbank CIB told RT in an interview fielding a question whether the rouble would engage in a currency war, or intentional devaluation. "Stimulating economy, there always needs to be a degree of artificial stimulation," Vardanian said, citing interest and mortgage rates. 18:06 MST: Foreign direct investment boosted jobs in Russia by 60 percent, Ernst & Young survey. 17:55 MST: Russian exports have 'dropped sharply' to the US, decreasing about 10 percent since 2011, Economic Development Deputy Minister Aleksey Likhachev, who traced the peak trade fall to 2011. 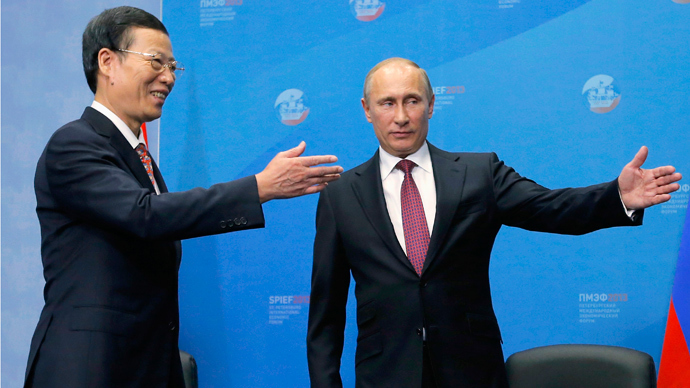 17:44 MST: Russia and China have prepared an unprecedented large-scale oil contract worth more than $60 billion, Vladimir Putin said in a meeting with First Deputy Prime Minister Wu Yi Zhang Gaoli. Rosneft, the world's largest public oil and gas company, will collaborate with Chinese companies as well as Gazprom and Novatek. Putin sees the venture as a 'large-scale long-term project which will last for decades', and expressed his confidence the deal marked a positive direction in Russia-China relations. 17:28 MST: Russia is most attractive European market for Nestle, according to General Director Maurizio Pantarnello. 17:27 MST: Severstal, a major Russian steel company, said it will refuse projects in India, citing business conditions are 'not yet ripe' citing problems with infrastructure and risk. 17:12 MST:"The situation in Russia underlies the need for infrastructure developments in oil and gas," said Vladimir Feygin, Director of the Institute for Energy and Finance. 16:51 MST: Russia's Scartel CEO Denis Sverdlov, former General Director of Yoda, said every household should have fiber cables by 2018. 16:40 MST: Russia is the sixth-most attractive country in the world for foreign direct investment, according to an Ernst & Young poll at Forum. 16:18 MST: Russia's GDP expanded by 1.8 percent from January to May, said Andrey Belousov, Economic Development Minister. 16:02 MST: Michael Andrew, Global Chairman of KPMG International in the RT studio. 16:00 MST: Russian and Italian construction companies sign a cooperation agreement to team up to reconstruct Moscow's Luzhniki' stadium in preparation for FIFA World Cup 2018. 15:59 MST: Unilever announces it will double its production capacity in St. Petersburg and update its' 'Northern Lights' factory. 15:54 MST: Sberbank President German Gref asked the audience who should be responsible for economic growth. 41 percent responded 'the government', another 41 percent responded 'the government and the Central Bank', and 18 percent said 'business'. 15:50 MST:"Whatever happens with or without China, there will be need for environmental cooperation," Maria van der Hoeven, Executive Director of the International Energy Agency, told RT about the race to the Arctic for energy in times of high energy demand and fragile economies. "Everyone is looking at the arctic through a magnifying glass. Whatever happens there will be seen around the world." 15:44 MST:"We have $82.5 billion in trade with the Netherlands. Increasing the flow of investment is always important, but in this turbulent economy, even more so," Vladimir Putin said in a meeting with Prime Minister Mark Rutte, a former top executive at Unilever. 15:35 MST: Mark Rutte, Prime Minister of the Netherlands, aims to exit recession by the end of 2013. The Netherlands is Russia's largest trading partner in Europe. 15:10 MST: Russian Central Bank chief Elvira Nabiullina says that the potential growth requires reform and investment, and that the current growth rate is 3 percent. 15:05 MST: Sberbank and leading Middle Eastern bank Emirates NBD signed a Memorandum of Understanding to cooperatively develop capital markets, investment banking, corporate banking, credit lines, and trade finance. 14:50 MST:"If Russia wants to become a global economy, and not just a large economy, needs to move away from energy and more towards value added manufacturing," said Basil Moftah, Managing Director of Emerging Markets at Thomson Reuters. 14:47 MST: Investment flow outside of Russia is a 'double-edged' sword. "Investment opportunities outside of Russia are becoming equally appealing and we need to decide whether to invest at home or globally," Pavel Teplukhin, CEO of Deutsche Bank, Russia, said. 14:45 MST:"To participate in this global market you need to have products," Siegfried Wolf, Chairman of Russian Machines said at 'Building Capabilities to compete in global markets. 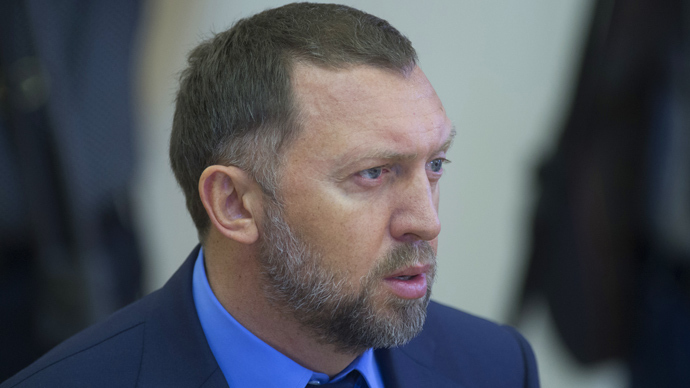 14:22 MST: Aleksey Kurdrin, former Finance Minister and Oleg Deripaska, chief executive of Rusal, discussed how to create a new generation of art Patrons. 14:05 MST: Russian officials are confident Bernanke's quantitative easing decision will not effect markets. 14:00 MST: Russian and Chinese authorities will build a $275 million bridge over the Amur river. 13:53 MST: Later today Russian Foreign Minister Sergey Lavrov will meet with Iraqi Kurdistan president Masoud Barzani, as well as with Lebanese government officials. 13:48 MST: Russia’s largest private oil company, Lukoil will work with Russian lawmakers to boost shale oil production, President Vagit Alekperov said at the Forum. 13:44 MST: There is limited capital and growth around the world. Lowering corporate tax rates is a strategy for countries to attract more capital, Mark Weinberger, CEO of Ernst&Young told RT Business at the G20 studio in Petersburg. 13:34 MST: What Russia needs is "smart money" said Pekka Viljakainen, Chairman of AII Capital. 13:28 MST: According to Russian Finance Minister Anton Siluanov, there will be no drastic changes in the rouble's exchange value rate through the end of 2013. Siluanov added there is no economic recession in Russia. 13:24 MST: Aleksey Miller, Gazprom CEO, reveals his company's strategy: Gazprom will now purchase pipes through direct contracts with producers, and no longer through traders. 13:20 MST:"The world is changing and the decisions taken by the Fed are crucial, but I think tapering is a well-balanced decision,"Alisher Usmanov told CNN. 13:16 MST: RT exclusive interview with Mark Weinberger, CEO of Ernst&Young coming soon. 13:03 MST: Mario Draghi, President of the European Central Bank, said he will do everything he can to save the Euro currency. 12:55 MST: Russia's wealthiest man Alisher Usmanov and co-owner of Arsenal Football Club, will sit down with CNN to discuss football, Bernanke, the US Federal Reserve, Apple Co., and the stock market. 12:54 MST: The level of debt in China, one of the biggest in the world, around 200 percent. 12:49 MST: "Eurasian Economic Union is not a form of political integration. We think its taboo," Deputy PM Igor Shuvalov. 12:43 MST:"Growth of domestic consumption is Europe's way out of crisis." 12:33 MST:"It's not a Sberbank problem, its a regional bank problem," said Sir Suma Chakrabarti, President, European Bank for Reconstruction and Development. Panelists at the 'Delivering growth to Russia's entrepreneurs' agree that problems lie at the regional bank level, which aren't doing enough to develop tailored products and competitive advantages specific to their region. 12:26 MST: European banks have 15-20% of assets in government bonds - a very big risk, reports Head of RT Business Oxana Derevyanko. 12:17 MST: Choi Kyong-lim, Deputy Minister for Trade, Industry and Energy, Republic of Korea said that bilateral trade between Korea and Russia reached $22 billion last year, a 100% increase over the three years, but only 2% of Korea's worldwide net trade. 12:15 MST: Natural gas consumption in Europe will continue to contract, and likely won't return to pre-crisis lvels in the next decade, according to Maria van der Hoeven from the International Energy Agency. 12:11 MST: Chinese predict exports from China will become more expensive. 12:10 MST:"Trade is a great driver of regional integration" - Secretary General Angel Gurria of OECD. 12:02 MST: Russian President Vladimir Putin will meet with Dutch Prime Minister Mark Rutte to discuss economic bilateral cooperation agreements. The Dutch PM is an honorable guest at the forum. German Chancellor Angela Merkel is also an honorable guest. 11:58 MST: Eurasian Economic Commission's Viktor Khristenko is moderating the round table discussion on globalization. 11:51 MST: Russian President Vladimir Putin will attend the signing ceremony for an agreement for integrated transport between Russian Railways, Kazakhstan, and Belarus. 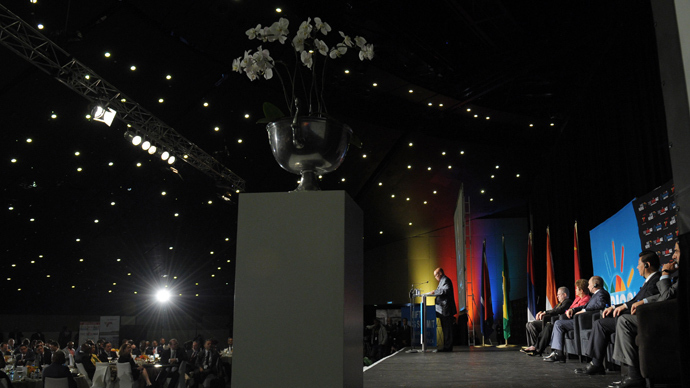 11:47 MST: Vladimir Yakunin, president of Russian Railways, will speak at 'Beyond Brics'. Last night a false report leaked that he had stepped down as president of RZD. 11:43 MST: Next up is 'Regional economic communities: integration to compete and pathways to inclusive globalization. First Deputy Prime Minister of Russia, Igor Shuvalov, is set to speak. 11:40 MST: The PepsiCo Cafe is open and greeting guests. 11:10 MST: Central Bank Deputy Chairman Aleksey Ulykaev announced he foresees Russia's inflation slowing year-on-year to 7 percent in by July. 11:00 MST: Today's schedule. Watch the live broadcast on the forum website. 11:45—13:00 CAN THE SUB-SAHARAN AFRICA SUCCESS STORY CONTINUE? 14:30—16:00 ARE CENTRAL BANKS THE LAST STRONGHOLD OF ECONOMIC GROWTH? 16:00—17:15 WHICH COUNTRIES OFFER BEST CLIMATE FOR IT BUSINESS?